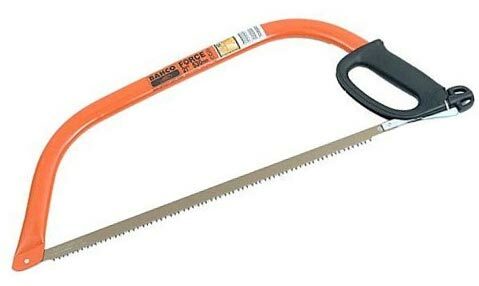 It doesn’t matter what you need a chainsaw for, it’s one of the most unique and diverse items that will save huge amounts of time in the garden. There’s nothing like trying to chop through a log that takes at least 5 minutes with a hand saw, Two only going cut through it in about 3 seconds flat with a sharp chainsaw. In this article I’m going to look at all the different types of chainsaws available on the market today. I’m going to start with the low end chainsaws that most gardeners would using their home. Then I’ll work my way right up to the most expensive and useful items on the market for professional and commercial use. Before we get started I am going to provide a table of the most useful chainsaws in this article. If you haven’t got the time to have a full read and you’re just looking to quickly buy one here’s our top picks that we thoroughly researched. These are best value for money as of February 2019 and the overall best performance in terms of your personal application. By your personal application what we mean is depending on your circumstances you might require a different chainsaw. If you’re a commercial landscape specialist you’re going to want the very best. If you’re just a budding home gardener then of course it makes no sense to spend out massively on an item that you may not use all that often. We look for the best value and all between for all of our readers. 1.1)Chainsaws for sale: used in a small garden. 1.12)Electric chainsaws for sale: what I do like. 1.13)Electric chainsaws for sale: what I don’t like. In the chainsaws for sale section we take a look at the best value for money as well as the cheapest and the most expensive chainsaws available on the market. Chainsaws for sale vary significantly depending on the bracket and price range. Predominantly, there are two main chainsaw types; petrol and electric. Obviously the petrol has huge advantages as you are not limited to and by distance. Electric chainsaws however have significant advantages over petrol; you don’t need to store flammable fuel, You just need to have a decent extension lead available to you and you’ll be able to go all over your garden. That just doesn’t work out for people with huge gardens or estates. So let’s start by looking at some different cases and uses for these chainsaws. If you have a small garden and you’re just looking to cut back a few fairly chunky trees here and there, then you’re almost certainly going to be better off with an electric chainsaw as they are considerably cheaper as well as requiring considerably less maintenance. If you carefully think about petrol chainsaws requiring maintenance and then there’s storage of flammable fuel, that’s needed on hand. There’s a lot of good reasons not to bother with a petrol chainsaw in this situation, ownership is probably too much work for lights use. We’re going to compare to electric chainsaws for you in this section. We are going to look at the cheapest available online and another one that I believe to be the best value for money. The best value for money is almost certainly the right pick but it still makes sense to take a look at the cheapest anyway. Having a comparison between the two is going to be useful helping you decide which one to select. 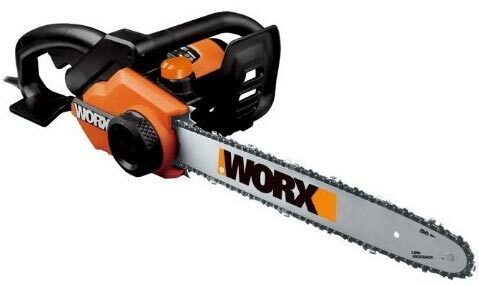 For my money the Worx 40cm electric chainsaw is without a doubt the best electric chainsaw in the market as far as using in the home garden is concerned. It’s absolutely ideal for a part-time users and requires absolutely no maintenance at all as well as being very safe for DIY’ers. Please note though, always read the safety instructions before use. Has a quick stop gear system for extra safety. Comfortable grip for a vehicle purchase and safe to use. It also comes with a metal spike bumper which is extra handy. It has a 40cm cutting bar which is capable of any home garden cutting. The oil tank is 200 ml is which is going to last along time without my team. With it only weighing 4.8 kilos, it’s extremely easy to use. The chain speed is impressive 12 meters per second. This electric chainsaw comes with a free lubrication oil pack. Blade protection for safety and maintenance. If you asked me to name some negatives I’d really be struggling. The biggest issue for me of course is always carrying around the power lead with me. Carrying the power lead becomes cumbersome and difficult. Especially if there’s prolonged use. But then, as we’ve already discussed, if you’ve got a lot of work to do than you probably going to be better off with a petrol chainsaw. The electric chainsaw isn’t designed to be used all day. It’s designed for a little bit of cutting here and there. Another thing I don’t really like about the electric chainsaw is the fact of cutting in wet conditions is almost impossible. If you think about needing to lay a power lead down on the floor, then it’s not ideal because you’d be worried about getting an electric shock. You’ve got two options really, you are either way for the weather to improve, or you have to work a system to get the power of You’ve got two options really, you either way for the weather to improve, or you have to work a system to get the power cable off the floor. But let’s be honest, this is actually a problem with all electric corded tools and we always work a way around it. No one particularly wants to work out in the rain anyway. Working out in the rain is not fun and it’s actually no good for your health either. We’ve already covered the best electrical chainsaw for sale at a reasonable price but I also mentioned earlier on in the article I would also try and go through the absolute cheapest electric chainsaw for sale . Don’t get me wrong, this chainsaw still does the job and I really want to be clear about that there’s absolutely no problem at all with the wood cutting, but it’s just not got the power of the one we’ve already been through. If you have a little bit of time and you’re not worried about the cut speed then this one might work out well for you too. 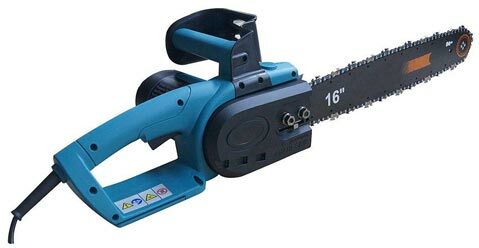 The cheapest electric chainsaw I’m aware of is the Katso 1600W. One of the things I really don’t like about this chainsaw although advertised as a benefit is the fact that you can’t actually refill the oil in it and it’s a seal fixed unit. This to me has a number of problems, the main one of course is that if the thing does develop a leak then that’s it, you might as well just throw it away. At least with a refillable unit you can actually service and if there is some small leak then it can actually be repaired. With the fixed unit, once they oil runs out you are basically stuck because you just can’t get the oil back in it. To my mind this is a completely disposable product and won’t have much lifespan that all. If you consider that it only comes with a one year guarantee as well, to my mind you can’t really expect this product to be of any use to you after that year. With that said, I’m absolutely certain many people are going to completely disagree with me, because not having an oil cap means that you simply don’t need to service a thing. From a DIY perspective this actually might be a godsend because you do not need to worry about maintenance at all. The price, under £40, it just can’t be touched. 1600 watt motor packs a decent punch. 40 cm bar length more than enough for home use. Buy reputable retailer so if there is an issue then can be returned. There’s not really a lot more to say than that, it is extremely cheap electric chainsaw, it does the job but it’s not the best in the market. If you’re willing to spend that little bit more money then you’re going to get a lot better quality. And let’s be fair, it clearly obviously beats using a bow saw. To conclude this electric chainsaw for sale article I would definitely consider the Worx electric chainsaw to be a good buy. It has enough power and reliability to get the job done in a medium garden, but at the same time enough quality to last. Of course as we’ve already covered, it’s electric and therefore a little bit cumbersome, but if you’re only using it for a few specific jobs then definitely not worth the full on petrol investment. Nothing beats the freedom of a petrol chainsaw. It doesn’t matter whether it’s your garden, a customer, or your own little bit of woodside, a petrol chainsaw gets the job done. A petrol chainsaw has a huge advantage over an electric chainsaw in that you can use it almost anywhere, take it with you in the back of the truck, just pick it up and get going. I hardly need to go into the benefits of petrol chainsaws so let’s just look at the prices and compare the performance as well as features of them. I intend to take a look at the bottom, middle, and top of the market. And let’s just see if we can find a bargain in there somewhere. Nine times out of ten you get what you pay for but that doesn’t mean that there isn’t some kind of deal to be had here, After all we came across an incredible unknown brand petrol leaf blower vacuum in a previous article that saved literally 70% on the price of a branded one. It also had very similar capabilities, and to my knowledge lasts well too. It comes with a 3.4 horsepower engine. This engine is 58 CC, 2 stroke. Being two stroke it only weighs 5 kg. This makes it very easy to handle. It has a very fast acting chain break. This means that it’s extremely good for safety. The chain is self lubricating so there’s minimal maintenance. The bar is 50cm which will cut through a very thick tree. Handily they supply this chainsaw with an extra chain for free. They also supply a second bar in case that breaks too. What’s this clearly isn’t the most sophisticated petrol chainsaw on the market, one has to consider that it’s barely the price of a cheap electric chainsaw. With that in mind this is a really good deal, Whilst I’m not sure about the quality and it lasting, all feedback points to this thing being a great cutter. Talking of cutters, I would be surprised if the chain is high-quality steel, I mean how could it be at this extremely competitive price. If I were to categorise this chainsaw, it would be for someone with small to medium use, and absolutely no way of using electric power. This cheap petrol chainsaw allows that freedom that electric chainsaws simply won’t give you, and considerably more powerful with a two-stroke petrol engine. For the mid-range petrol chainsaw I’m going to look at the best value for money. To me, it makes sense that we find the best value somewhere in the middle almost always. The best value petrol chainsaw doesn’t have to be cheap either, but in the interest of trying to keep this balance with a low, medium, and high end petrol chainsaw, I’m going to try and find one that’s pretty sensibly priced down the middle. It comes with a 62 CC, 2-stroke engine, so delivers tons of power. It’s very neat and tidy, it comes with a carrier bag and an extra bar. The toolkit is provided in a nice study case. Surprisingly, for a lesser known model it has great instructions. Handy 2-stroke and petrol mixing bottle to get the right mix. And the best saved till last, it comes with a 2 year guarantee. Aside from the really impressive spec it comes with a lot of really cool feedback. Many people are saying that it’s super quick and easy to set up. Some people have got this thing from open packaging to cutting trees down in less than 30 minutes! Many uses of notice just how incredibly powerful the engine is on this petrol chainsaw. It’s more than capable of taking down 15 inch trees with ease. That’s a lot of wood for an amateur chainsaw user. If you look in the mid-range costs then a piece of equipment that’s capable of removing 15 inch tree is quite incredible, especially when this things under £100. But the thing I like most about this chainsaw, is actually all of the negative reviews. Almost all of the negative review suggested this chainsaw could be disassembled and repaired quite easily. So many people noting how they took the thing apart and fixed it. What we’re not realising here is that this is a great asset. If you look past the fact that it does need repairs, as all chainsaws will, and especially ones that are in this price range. If we can look past this then we can see that it’s a great piece of equipment that’s actually serviceable. It’s hard to find serviceable items for this kind of price range, especially the ones that are very powerful and actually doing the job properly. There were few clear issues with this chainsaw. But that’s to be expected when you’re looking at a product that costs literally a third of a branded version. The Chinese simply can’t replicate the quality of a There were a few clear issues with this chainsaw. But that’s to be expected when you’re looking at a product the cost to literally a third of a branded version. The Chinese simply can’t replicate the quality of a Stihl petrol chainsaw for example, not on a shoestring budget anyway. Another disadvantage that I believe exists, not that it would be that obvious, is the fact that it’s actually so light weight. Initially, you would think that this is an advantage. However, in my mind this actually highlights the fact that the petrol chainsaw probably quite a lot of plastic components inside. That’s actually backed up by the number of failures that are being witnessed. But, that doesn’t mean that this is all bad because they are serviceable as the reviews indicate. My biggest fear with any cheap petrol engine is the pull start. It doesn’t matter whether it’s in an outboard for a boat, or a chainsaw. Whenever it’s a cheap version the pull start always seems to fail first. I did go through 300 reviews and found quite a few examples of the pull start failing too. I don’t find this to be a surprise, I just think it’s expected based on the cost of the item. It’s quite clear that if you’re going to go for an item that is a third of the price of a branded model then you’re going to have to put up with a few niggly problems. That said, in my mind this is an absolute bargain because it cuts exactly the same way as a branded product, and has plenty of horsepower to do the job.